The long-awaited ecobee Switch+, a smart light switch that offers Siri HomeKit voice control via far-field voice technology, is coming at the end of March. Other than HomeKit, The Switch+ also uses Amazon's Alexa Voice Service and Google Assistant, and other platforms. A room sensor feature associated with the Switch+ itself will be available later in 2018 through a firmware update. "Our research finds voice-based services are actually outpacing all other ecosystems at a rate of three to one," ecobee President and CEO Stuart Lombard said. "With ecobee4 and now ecobee Switch+, voice literally weaves into the very fabric of your home, taking us one step closer to a whole home voice reality, which is proving to be the future of the smart home." The product's availability was announced at the South by Southwest conference in Austin, Tex. It is available for preorder now and in stores March 26. The product had been announced in the spring of 2017, with a pilot program launched in September. 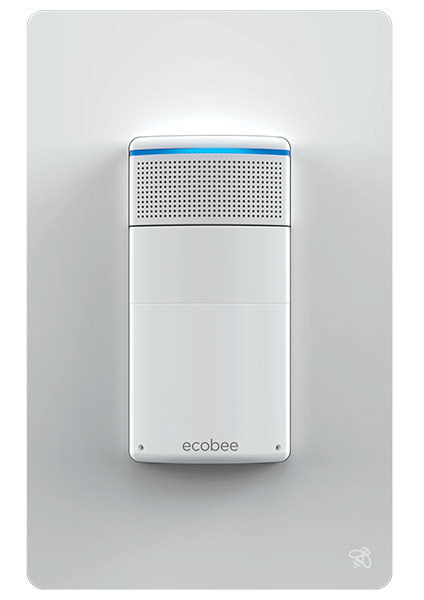 Smart home company ecobee, founded in Toronto in 2007, has primarily been associated with smart thermostats for most of its history. Its products have integrated with HomeKit ever since the release of the updated ecobee 3 in 2015, and continuing with last year's ecobee 4.